Bumper Bubbles is a Free-for-All minigame featured in Mario Party 9, and returns in Mario Party: The Top 100. Its name is a reference to bumper cars. The players swim in their bubbles up to the center from offscreen. They then fall back to the bottom of the screen. 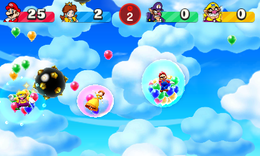 Players float around the screen inside bubbles, trying to collect and keep as many balloons as they can, while avoiding Spiked Balls. If players collide with a Spiked Ball, all of their balloons are released, and they fall off the screen temporarily. Players can bump other players by colliding with them. Five balloons spawn every four seconds until the last five seconds of the game. After 60 seconds, the players with the most balloons wins. "Hold the Wii Remote sideways. Tilt left or right to move. Hold to rise." Rules – "Guide your bubble to collect as many balloons as you can. If you hit a Spiked Ball, your bubble will pop and your balloons will scatter!" Description – "Tilt the system to move your bubble and collect balloons!" On-screen – "Collect lots of Balloon!" This page was last edited on May 26, 2018, at 10:20.